At a site in the Saharan desert on the border between Egypt and Libya, scientists have determined a huge 19 mile-wide crater was formed by an impact of a rock from space. More like an entire asteroid probably. They used satellite photos to help make the determination. Provided was a picture from an enhanced Landsat satellite photo. Naturally I had to go into Google Earth to see if I could find it. 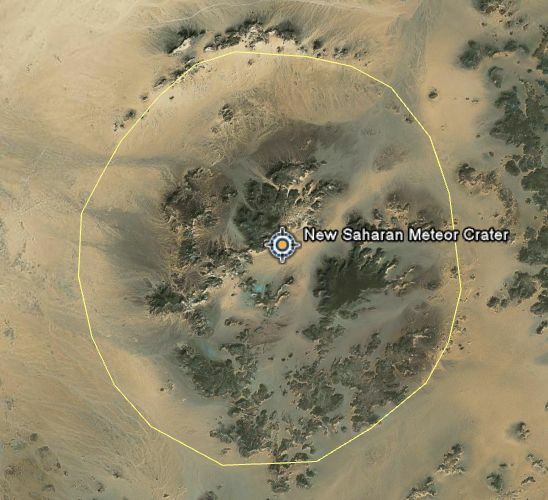 Not only did I find it easily, but it was quite recognizeable in GE that its a meteor crater . I'm surprised it took this long for someone to notice! The scientists said this crater is so large it probably would not be noticed except from space. Here's the story at space.com. You can check out lots of craters in Google Earth, and here's a link to an earlier story I did about the crater collection. Yes, even if you turn on "Google Earth Community" it comes up, "Hit over 120 million Years ago. ( http://img313.imageshack.us/img313/9831/crater8ot.jpg ) Again go north west of the original posted crater and you see another one, maybe from the same one that happened 120 million years ago. Both the mentioned Oasis and B.P. Structure mentioned have a dating of <120 million years. According to the confirmed impact database. So it's not to far off to think they were part of a larger piece of rock that broke up and hit the Sahara a long time ago in multiple strikes. Just take a look at the Arkenu craters and Aorounga crater(s). Those are also multiple impacts at the 'same' time. But they are much closer together. Statistic people should have a field-day explaining why there are three multi-strikes in such a small part of the world. Either the dating is false or multiple strikes at once are more common... Just a thought. In which the new found crater isn't present, yet. I�m new to GE, but why are these huge circle shaped mountains near Agades right in the middle of the Sahara desert not mentioned as impact sites? Aren�t that craters? It's Timia, which is a great volcanic site 200 km (130 miles) north of Agades.